We met at Colette's and, although she was unable to attend, Jolene hosted. Present were Beth, Carla, Colette, Jane, Linda, Michèle and Shirley. We began with a very nice wonton soup and lovely tea sandwiches, a very tasty dip and some nice cheese. Jolene also made a wonderful frozen rasberry pie with a chocolate crust. We also had a nice bubbly which some of us drank as a mimosa with orange juice. Thank you Jolene. The dessert was especially nice. This month's book was Do Not Say We Have Nothing by Madeleine Thien presented by Beth. Ms. Thien was born in 1974 in Vancouver the year her parents immigrated to Canada. Her father was a Malaysian Chinese and her mother was from Hong Kong. She studied Dance at Simon Fraser University and then completed an MFA in creative writing at UBC. Do Not Say We Have Nothing is her fifth published book and second novel. She also published two books of short stories and a children's book, The Chinese Violin. 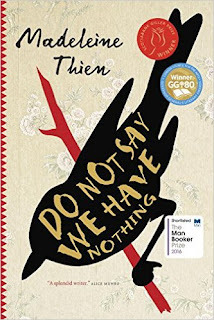 Ms. Thien's last two books, Do Not Say We Have Nothing and Dogs at the Perimeter, have dealt with repressive and cruel regimes in China and in Cambodia. It has meant that she spent the last 10 years researching the devastation and cruelty caused by regimes that controlled the people of their country by fear, repression, starvation and cruelty. Do Not Say We Have Nothing is the story of three musicians in China, Sparrow a composer, Jiang Kai a pianist and Zhuli a young violinist. The story spans about 60 years beginning when Mao Zhedong came to power in 1949 through to the events of Tiananmen Square in 1989. The story is narrated by Jiang Kai's daughter Marie who lives in Vancouver. The story begins in Vancouver with Marie recounting her father, Kai's suicide in Hong Kong in 1989 not long after the events of Tiananmen Square. The story recounts the trials and tribulations of the three musicians and their families through China's rollercoaster history, from the schemes of the "Great Leap Forward" era of the 1950's, the famine especially in the countryside when Kai loses his whole family to starvation; the Cultural Revolution and the re-education camps that Zhuli's parents were forced to endure; the destruction of all Western- inspired culture when the Shanghai Conservatory of Music was closed and instruments were destroyed and the pro-democracy student-led demonstrations that ended with the massacres of Tiananmen Square. Throughout the story the three musicians study and teach. Western classical music is frequently referenced, beginning and ending with Glenn Gould's interpretation of Bach's Goldberg Variations. Many of Ms. Thien's most beautiful passages come out of references to music such as Beethoven's Emperor Concerto when Marie is riding in the car with her father in Vancouver (pg 14) or when Sparrow listens with his father to Bach's Goldberg Variations No. 21. All of us found the book to be a challenging read. In the first half of the book, especially when it jumps from Vancouver to China and from one era to another, it is difficult to understand who is who and when events are taking place. However, all found that the book is a worthwhile read. One of our members described her phrasing as "delicious" and musical. The complexity of the story required time, many of us taking three to four weeks to finish the book, and a couple of our members read it more than once. It was informative as we learn a lot about China's modern history and how the decisions of its leaders impact the population and especially the two families we follow. Beth suggested, for anyone who would like to learn more about China's modern History, Nien Cheng's book Life and Death in Shanghai published in 1986 and available at the Ottawa Public Library. Michèle also suggested that we read Bob Douglas' review on the website "Critics At Large" The Power of Music and Remembering . Thank you Beth for selecting this challenging book and thank you Jolene for providing such wonderful food, good for the soul and spirit.